Today's guest post is I believe the third for Dr. Sara Kirk. Dr. Kirk holds a Canada Research Chair in Health Services Research within the School of Health and Human Performance at Dalhousie University and a cross-appointment with the IWK Health Centre. 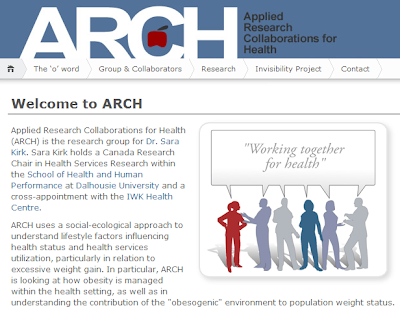 Sara’s research group, Applied Research Collaborations for Health (ARCH), uses a social-ecological approach to understand lifestyle factors influencing health status and health services utilization, particularly in relation to excessive weight gain. 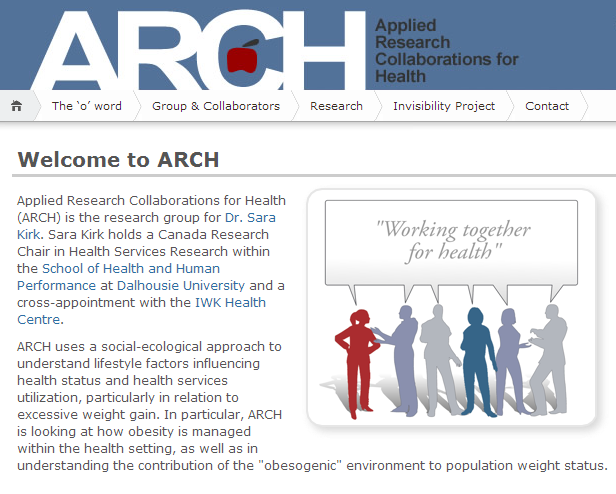 In particular, ARCH is looking at how obesity is managed within the health setting, as well as in understanding the contribution of the "obesogenic" environment to population weight status. Today Dr. Kirk shares with us an innovate project out of her ARCH group that looks at the dialogue between a person with obesity and their physicians. The recent guest post “Do Medical Schools Teach Future Doctors About Weight Management?” by medical student, Jill Trinacty, highlights a number of shortcomings with the current model of medical education when it comes to doctors counselling obese and overweight patients. The frustration Jill feels is indicative of the health care system as a whole: as we grapple with rising rates of obesity and an overburdened health system, there is a lack of clarity around who the key players in managing obesity are, particularly in the primary care setting, and how they view this problem. Many health care professionals feel ill-equipped to identify and deal with issues around weight management and are unsure of their roles and responsibilities. These deficiencies deserve attention within the Canadian health system, and indeed elsewhere, and innovative research in Nova Scotia is tackling them head-on. Through a series of in-depth interviews, we have examined the experiences of individuals living with obesity, the perceptions of health care providers and the role of social, institutional and political structures in the management of obesity. This study is the first, to our knowledge, to look at the challenges of managing obesity from these multiple perspectives. In over 40 interviews, we observed how the management of obesity within the health care system is rife with weight bias, stigma and blame. Individuals living with obesity felt that they did not receive the support they needed from their health care providers, while health professionals did not know how best to raise the issue in a respectful way. Furthermore, many participants shared that the relationship between the individual and the health professional was critical for successful weight management. Individuals living with obesity reported feeling that, due to the sensitive nature of the topic of weight, the existence of a trusting, mutually respectful relationship with their health care provider was essential. Unfortunately, this was not their experience in practice. On the other side of the therapeutic relationship, health professionals shared their views related to their own professional frustrations regarding the challenges involved in managing obesity within a system that is not structured to support chronic health conditions and a health issue for which they receive inadequate training. Many health professionals wanted to be able to offer more support, but simply did not know how to within the constraints they faced. Our findings highlight the need for better education for health professionals as Jill identified in her post. The rich narratives we obtained from our participants have subsequently been developed into a dramatic presentation, depicting the relationship between a health professional (family doctor) and an individual living with obesity (patient). In this dramatic presentation, both internal and external dialogue highlights the spoken and unspoken tensions that were identified by our participants. Early data from pilot work suggests that the presentation offers a powerful medium to raise awareness of these tensions and to provoke a constructive dialogue to address them. We have shared two videos (also embedded down below), one discussing the study findings and a shorter recording of the dramatic presentation. These are available for educational use. This dramatic presentation is ideal for use as an educational tool for health professionals to address the tensions identified through this study. We will also be showing the live drama at interprofessional education events across Atlantic Canada. If you are interested in having the dramatic presentation performed live at an event, please email for details. Our findings add to a growing body of literature that challenges a number of widely held assumptions about obesity within a heath care system that currently is not designed to provide the support that individuals living with obesity need. It is our goal that the study data inform obesity policy management practices for the future. We think helping health professionals see what is going on behind the scenes is a step in the right direction and we look forward to hearing the views of your readers on our approach.